While since the end of the Cold War, the turnout for Presidential elections has been between 51 % and 61 % (with the exception of the vote for Bill Clinton’s second mandate, which interested only a minority of electors), the mid-term elections attract between 36 % and 41 % (with the exception of 2018, which apparently reached 49 %). So, from the point of view of citizen participation, the rules of the game are democratic – however, in practice they are anything but. If there were a quorum, the members of Congress elected would be few and far between. Representatives and Senators are usually chosen by less than 20 % of the population. During this campaign, I observed that the powerful ascension of Donald Trump marked the resurgence of a fundamental conflict – on one side the descendants of the « Pilgrim Fathers » (the Puritans who founded the British colonies of America) and on the other, the descendants of the immigrants who fought for the independence of their country. These two groups found a consensus around their Constitution. The major landowners who drew up the fundamental laws explained exhaustively that they wanted to reproduce the political system of the English monarchy, but without creating an aristocracy. However, the second group who added the Bill of Rights (the first ten amendments to the Constitution), wanted to pursue the « American dream » without running the risk of being crushed by some sort of « raison d’état ». Over the last few years, the Democratic and Republican Parties have evolved to become the spokespersons of Puritan thought, defending moral order and imperialism. The Bushes are the direct descendants of the « Pilgrim Fathers ». Barack Obama composed his first cabinet by relying massively on the members of the Pilgrim’s Society (the transatlantic club presided by Queen Elizabeth II). Hillary Clinton was supported by 73 % of Judeo-Christians » etc. On the contrary, Donald Trump represented, on his own, the other component of US political history. In no more than a few months, he managed to take control of the Republican Party and steer it towards his own convictions, at least in appearance. It was this conflict that threatened to manifest again under Richard Nixon, and which today has become clear to all. It is not without note that the best historian on this question is Kevin Phillips, the ex-electoral strategist who helped Nixon to gain the White House. 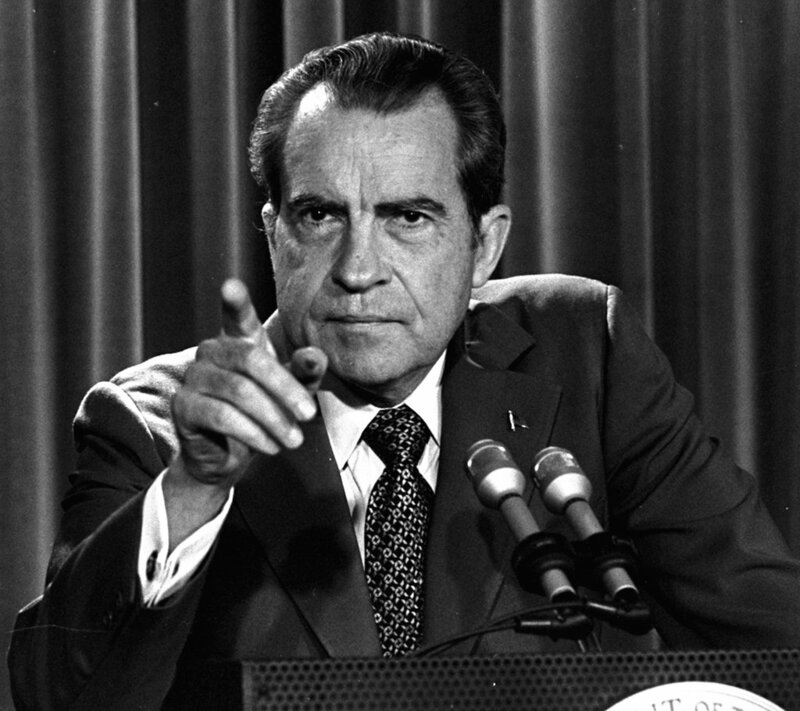 Nixon rehabilitated the electors from the South, recognised the Peoples’ Republic of China, and ended the Vietnam war (which had been triggered by the Democrats). He entered into conflict with the Washington establishment, which forced him to resign (the Watergate affair).